This South Africa and Botswana tour-from the fascinating cities to the enthralling game drives and breathtaking scenery-is sure to offer you an experience of a lifetime. Start in Cape Town, one of the most beautiful cities in the world. Ride a cable car to the top of iconic Table Mountain (weather permitting) for stunning views over the city and venture outside the city to see a colony of African penguins and beautiful Cape Point Nature Reserve, a UNESCO World Heritage Site, known for its rich and unique flora. You’ll also visit Bo-Kaap, a lively area founded by former slaves. Here visit a local family home to learn more about their culture and partake in a Cape Malay cooking class-a Globus exclusive! Your journey continues in Makalali Private Game Reserve near Kruger National Park. Here, enjoy six game drives in an open-air, 4-wheel-drive Land Rover. Your professional ranger and skilled tracker will help you search for a remarkable number of species, including 42 mammal species and 350 bird species. You’ll have a great chance to see the "Big 5"-lion, leopard, elephant, rhino, and Cape buffalo. Have your camera ready because you may also see impala, giraffe, hippo, spotted hyena, cheetah, wildebeest, and more. Even stop for sundowner drinks in the bush! In Botswana, enjoy five game activities in Chobe National Park, home to one of the largest concentrations of game in all of Africa and to what many believe are the world’s largest elephants. Keep your eyes out for lion, leopard, cheetah, giraffe, lechwe, kudu, and more. 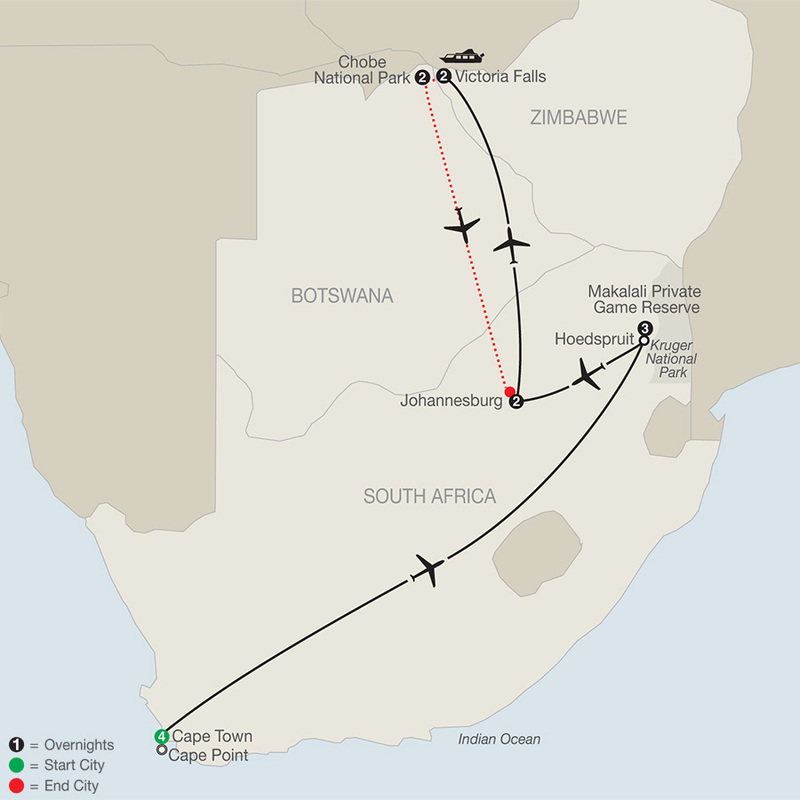 Other highlights include Johannesburg’s unforgettable Apartheid Museum and Soweto, the country’s largest township, where you will visit the former home of Nelson Mandela and stunning Mosi-oa-Tunya (the smoke that thunders) also known as Victoria Falls, spanning the border of Zimbabwe & Zambia. 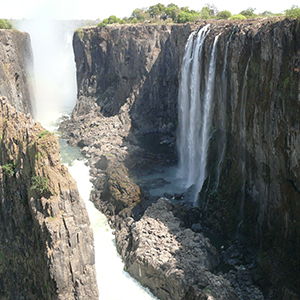 Take a guided walk along the falls, which is roughly twice the height of Niagara Falls, and cruise on the Zambezi River at sunset. And you’ll be part of a small-group, with no more than 20 total guests, ensuring personalized service from start to end! All of this-and much more-are waiting for you on this tour of South Africa and Botswana. You’ll return home with plenty of stories and photos to share with your friends and family. Globus vacation packages are built on the belief that each destination should become a fascinating chapter in the story of your life. Globus tours are enriching journeys—we make sure travelers experience local culture and unique attractions that remind you why you love to travel. From transportation to hotels; and from researching must-see attractions to organizing daily schedules, planning a vacation is no easy task. That's where escorted tour packages come in. With escorted travel, you sit back and leave everything to us. When we envision the perfect vacation, we see great hotels, amazing food, incredible sightseeing, and above all, we imagine creating memories galore! What we don't picture is what it takes to organize a jaw-dropping, stress-free getaway. Everyone loves extras – until they're charged extra. So we include more visits, toss in more experiences, and include more sightseeing, all in the price of the vacation. So the only surprises you'll encounter are the ones we have thoughtfully planned for you. Many travel operators tend to overschedule, instilling the need for a vacation after your vacation. We weave in just the right amount of free time for individual exploration, quiet reflection, or a book and a latte at a sidewalk café. A hotel can have the crispest sheets, the fluffiest towels, and the tastiest pillow mints, but if it's not near the sights, what good is it? Not much. Because what you love just as much as the sights is waking up right next to them. 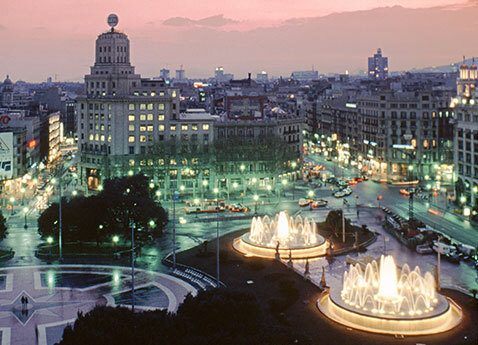 Our experts bring our destinations to life with firsthand, in-depth knowledge of their cities, towns, and neighborhoods. They speak the language. They know the history. They know where to find the legendary pastries. We don't just travel, we travel right. We work hard behind the scenes to get you front and center at the world's greatest sights. We minimize lines, minimize wait times, and maximize fun.